In December 2017 I was introduced to PUR attitude, a skincare line that's dermatologist tested and approved, backed by independent clinical studies, and follows the brand’s standards for “Safe Beauty". 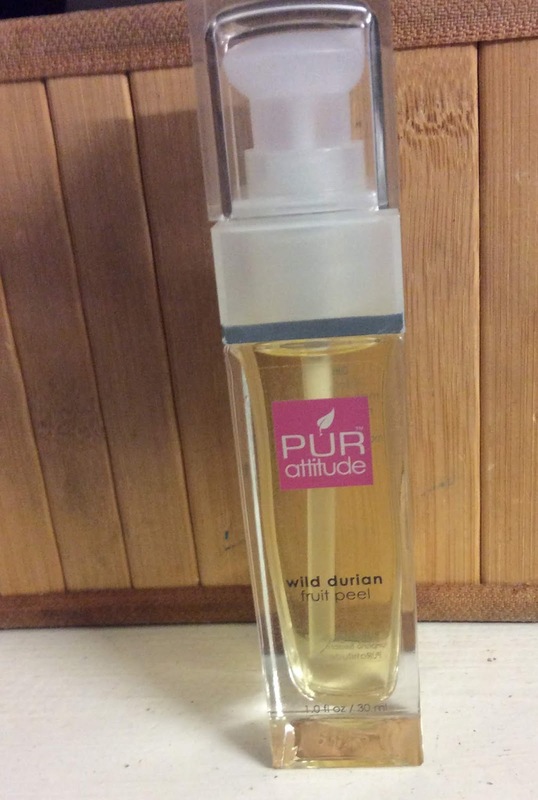 PUR attitude products contain only safe beauty ingredients and are not diluted with water. I had a "love, hate" relationship with the products I reviewed in December. Recently I was able to try the Wild Durian Fruit Peel. 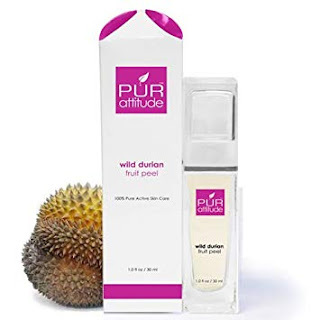 Wild Durian Fruit Peel is formulated to visibly even out skin tones, wipe away fine lines, and restore vitality and brightness for more youthful looking skin. Due to the activation of rare wild durian fruit, known for its pungent aroma and revered for its advanced anti-aging properties, this product is able to produce these powerful results on the skin without irritation. Wild Durian Fruit Peel is enhanced with the power of natural Hyaluronix™ technology, which delivers up to one thousand times its weight in water, binding moisture deeply into the skin. These natural ingredients are combined with pure glucosamine, ceramides, as well as extracts of orange, apple, and green tea to detoxify impurities, exfoliate lifeless skin, and unclog pores. I'd never heard of the wild durian fruit until receiving the Wild Durian Fruit Peel, so I did some Internet research to find out its description and uses. Pretty interesting, actually! I feel like the name of the product is a little misleading. It's not an actual facial mask that peels off but rather more like a serum to be applied to the face after it's been cleansed. Other than that, I have no qualms with the product itself. I don't believe any product can completely reverse the signs of aging but there are some out there that I've found to be beneficial in giving my skin a more youthful, radiant look. Wild Durian Fruit Peel makes my face feel and look brighter, as well as almost diminish the visible fine lines around my eyes. It's become a part of my beauty ritual that makes my skin feel good and gives it a nice gleam. 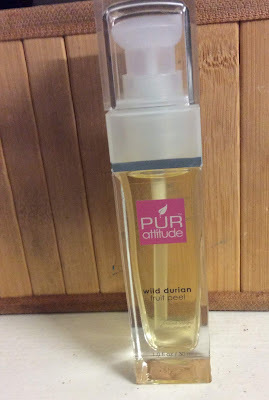 During the month of October, Pur attitude will donate $25 for each Wild Durian Fruit Peel sold to National Breast Cancer Foundation, Inc.® (NBCF). NBCF is an organization dedicated as much to the prevention of the disease, as it is to the cure, and holds excellent ratings with independent charity reviewers. PUR attitude chose to work with NBCF due to its alignment with PUR attitude’s own core mission to carry out responsible industry practices by providing carcinogen-free skincare. There's only a few days left in October so now would be the time to order the Limited Edition Wild Durian Fruit Peel. The only thing I knew about Durian fruit was that it had quite an awful smell. However, I'm always up for trying new skincare!